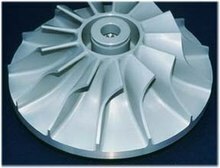 an air [a gas] turbine 空気[ガス]タービン. a steam [water] turbine 蒸気[水力]タービン. Any of various rotary machines that use the kinetic energy of a continuous stream of fluid (a liquid または a gas) to turn a shaft.